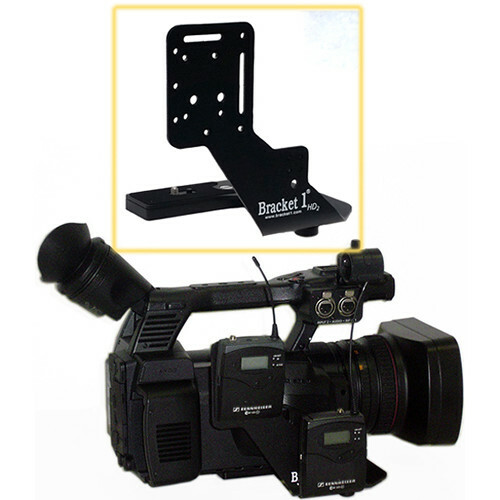 The Bracket 1a HD Wireless Camera Bracket is a wireless receiver bracket built to accommodate the wider-bodied high definition prosumer cameras. With its lightweight yet sturdy aluminum construction and wide variety of mounting positions, the HD can carry a receiver and other accessories at the same time. The unit conveniently attaches to the tripod threading underneath cameras without sacrificing the ability to mount the camera to a tripod whenever necessary. The bracket not only provides a convenient area to mount a receiver, it does so without blocking controls or impeding use. Manufactured with a light weight, high strength aluminum, the HD bracket will not break your back. HD2 Wireless Camera Bracket is rated 4.6 out of 5 by 13. Rated 5 out of 5 by Mike Hayes from Perfect for the Canon XF 300 / 305 I thought the price was a bit much until I received the product. It is very durable and fits the Canon XF 300 / 305 like a charm. I am a Middle School Science teacher who began posting video lessons for my students to review on YouTube. It has become a sensation for my parents and students around the world. I decided to make the out of pocket purchase as I am seeing the huge impact it is having for students. This bracket is perfect for my wireless LAV mic. The design still permits me to get to all the buttons and controlls and was just what I was hoping for. Once you have it on your camera, you will agree as I did, the price fits the product. Well made and functional! Rated 4 out of 5 by Robert M. from Sturdy, lightweight, versatile I use this bracket in pro and recreational settings with a Canon XH-A1. It is well-constructed. What I like best is the versatility. I use two Sennheiser wireless receivers and there is enough space on the Bracket to attach the receivers in several different configurations. This is especially useful when using the camera hand held. The Bracket is light, and it's a great feeling to pull the camera off the tripod and know my receivers are secure and coming with me. The only downside is that the camera doesn't seem to sit level on the Bracket when I attach it to the tripod. This could be a major bummer but I haven't confirmed it yet. Overall, a very useful piece of gear. Rated 5 out of 5 by Greg from Great product! Very well thought out bracket. Mount your shot-gun mic on the add on cold shoe well away from the camera lens. Rated 5 out of 5 by Anonymous from Almost perfect !!! Allows me to fix 2 Sennheiser Rx on this clamp. It is light weight and does not bother when holding in hand. Keeps camera horizontal. I would appreciate a spring guided pin instead of the fixed one, it can't be used on DSLR, so I need to buy another one for it. Rated 5 out of 5 by Anonymous from Great Product I use this product with my dvx100b. It is easy to install and looks professional. I mount my wireless receiver and shotgun mic onto it. It's great for the shotgun mic because it gets the mic away from the subtle camera noise and also keeps it out of the frame. Rated 5 out of 5 by Take 45 from Great Bracket I use this bracket to hold an FS100 (Firestore) to my HVX200. It works great. Very stable and easy to install to base of camera. Rated 4 out of 5 by Gameday Productions from Not Bad... I bought this to mount two Sennheiser EW100 G3's on it and then mount it to a Canon XF305. In the end I really like having them mounted and out of the way but it doesn't come with screws for the threaded holes nor do they tell you the size of the screws that should go in there. So I'm happy with the product but after I had to play guess the thread size to get everything mounted. Rated 4 out of 5 by Scott from Just what I needed Bracket works great in conjunction with the cradle holder I also bought to hold my FS-H200 DTE. The price was a bit steep though for formed metal which is why I gave it 4 stars instead of 5. Struggling to get a video business off the ground makes funds for new equipment tight.